When an unseasonably warm March – oh, those lovely days of summer clothes and sandals! 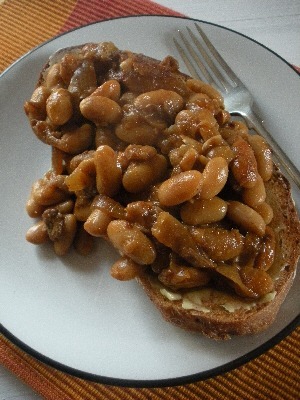 – segues into a freezing April, it’s time for a robust but gently spiced pot of (Home)Baked Beans. That’s not to say that these can’t be enjoyed at other times of the year, but there’s certainly something very cosy and comforting about tucking into some beans on toast when it is, as at the moment, hailing and storming outside the window. The (Home)Baked Beans are also especially warming if you forget to check the level of oil in your external central heating before putting it on when there’s a sudden cold snap and end up out of fuel and with an air lock. Ahem. Because this is best made with beans that you’ve cooked from scratch – hence the Kitchen Project label – I often make this dish over a couple of days, cooking the beans one morning then finishing them off the following day. In a hurry? You could always substitute four cans of white beans. On the other hand, if you get the cooking-beans-from-scratch bug, it’s always easiest to cook 500g at a time. Add flavourings like a split carrot, halved onion, a couple of celery sticks and some bay leaves to the cooking water before freezing the beans, in their tasty cooking liquid, in 300g portions. Pre-soaking the beans always cuts down on the cooking time and makes them more digestible. But, if you forget to soak the beans the night before you want them, all is not lost. Simply cover the beans with cold water in a large saucepan, boil hard for 10 minutes, turn off the heat and leave sitting for an hour. Drain, rinse and cook as normal. Sweetened with a combination of maple syrup and molasses, this recipe has a touch of Boston Baked Beans about it. I use mineral-rich blackstrap molasses, which gives a good bittersweet flavour to the dish. For the real Boston deal, use a 400g piece of pork belly instead of the streaky bacon and cook for 4 hours at 140°C (120°C fanbake). Soak the beans overnight in plenty of cold water. In the morning, drain and rinse the beans, cover with fresh water by about 5cm, and bring to the boil. Boil hard for about 10 minutes, then lower the heat and simmer gently for approximately an hour, until the beans are cooked. A good test is to remove a bean from the pot, blow on it and see if the skin bursts. Preheat the oven to 180°C (160°C fanbake). Remove the beans from the heat and drain, measuring the liquid and, if necessary, making it up to 500mls with extra water. 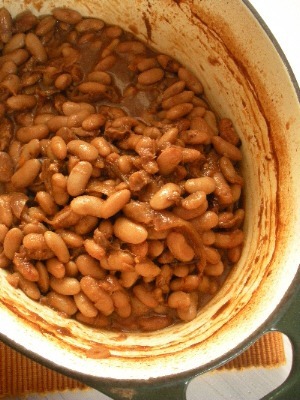 Place the beans in an ovenproof casserole dish, add the onions and garlic. Take a little of the reserved bean cooking liquid and whisk together with the tomato purée, maple syrup, molasses, mustard powder, cinnamon, smoked paprika and cloves. Pour this mixture over the beans and mix well with the bay leaf and chunks of streaky bacon. Season with pepper and cover snugly with the casserole lid or tin foil. Bake in the preheated oven for an hour, remove the lid or foil, then return to the oven to cook uncovered for another 20 minutes so that the liquid can reduce slightly. Taste and season to taste. Serve on buttered toast, with fried eggs, or over baked potatoes, topped with a dollop of crème fraîche and with some lemony braised broccoli on the side. Serves 6 or 2, with plenty of leftovers for freezing. Our parallel lives strike again! We did the exact same thing last week re: letting the oil run out and the resulting air lock. When will I ever learn? At least now we have the wood stove and the back boiler to keep us warm until the plumber can call out. I thought it was just me because I’m a newbie with the whole central heating thing! The cottage renovation has introduced me to the joys of “is the tank empty already?” and I never seem to get it right. The Husband was trying to get the oil through the airlock last night, almost making himself high in the process. Still not working – but I know he’s determined to get there in the end!